NV Range of HMI by Omron can be Connected with Siemens PLC. NV HMI is available in three different Models. It is a compact HMI for Packaged PLC. In Our earlier posts we saw NV HMI Modbus Communication and NV HMI connection with Allen Bradley PLC. Today we will see as How to connect NV HMI with Siemens PLC. NV HMI communication with Siemens PLC is possible in two different ways i.e through RS232 and through RS485. We will see both the Communication Procedure here. For RS232 Communication first of all connect the S7-200 PC/PPI Cable and then make the Communication Cable as Shown Below. Note:- Short the PIN 7(RS) and PIN 8(CS) at the PPI cable side. If you want to Communicate Siemens S7 PLC through RS485 with NV HMI then make the Communication Cable As shown Below. Note:- Short the Terminals 4 and 6 AND Terminals 7 , 8 with Terminal 5 at HMI side. Now our Half part is done , we now have to make some Communication Parameter Settings at both PLC side and NV HMI side and Also we have to define in NV Designer (HMI software to Make Screens in NV HMI) the PLC Model. First of all open NV designer and then after selecting the proper NV Model Number , select the PLC type as "Siemens S7-200 Series" and after that select System Memory Area accordingly. Note:- Click on the Picture for a better Enlarged View. Now we have to define the Communication Parameter settings at HMI and PLC side. 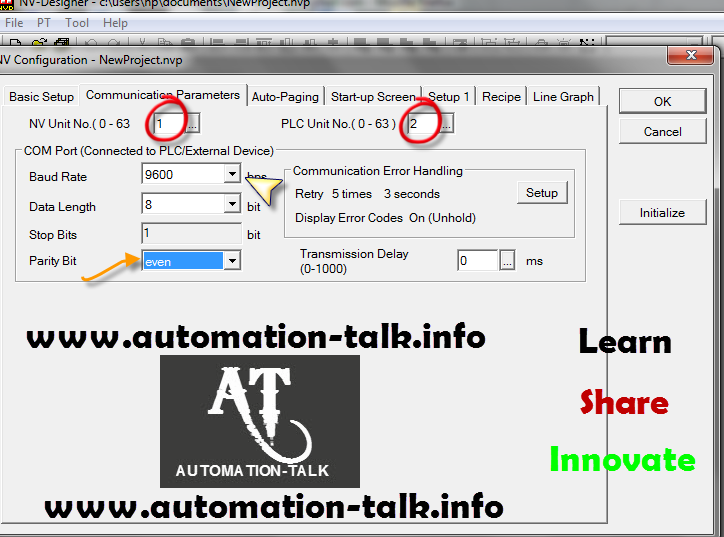 Click PT---NV Configuration and under communication Parameter Tab select NV unit Number as 1 and PLC unit number as 2 , Baud Rate - 9600Kbps, Data Length - 9600, Stop Bit - 1, Parity - Even. Also at the PLC side in the Programming Software make PLC station number as 2. 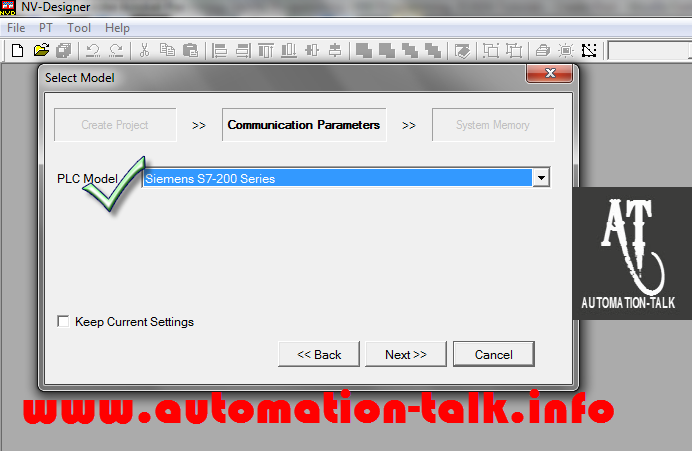 Now we are done with all the necessary Settings Required for communication Between Siemens S7-200 PLC and Omron NV HMI. Let us also see the Notation of Bits and Words of PLC by HMI. PLC Notation of Bit devices is Q3.2 but when u want to put this address in NV HMI you have to write as Q3-2. The PLC Notation and NV Designer Notation of Word devices is same as VW100. We hope that after reading this you can definitely Communicate Siemens PLC and Omron NV HMI.If still you face any problem you can write in Comment Section Below. Also you can subscribe to get all latest updates on Siemens PLC, PLC Programming,HMI and SCADA Tutorials.Subscribe to Automation-Talk by Email.